If you are one of those people who like marine animals, Wake Resto & Dolphin is it! 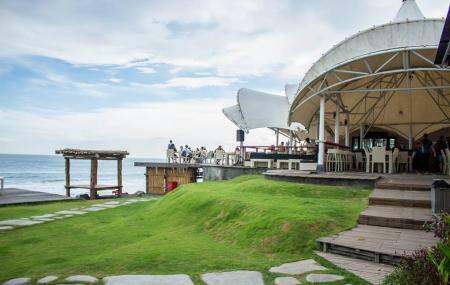 The place is unique in its own right given that its serves both- delicious food and some fun time with dolphins! There is a large garden set amidst the lush greenery accommodating about 150 people. More adventurous souls can go for camping activities in the camping area with all the amenities provided to them. And of course, there is a separate area where one can enjoy various fun activities with dolphins. Come with your family and friends and enjoy a delectable treat with all the other things it offers. The live music and dj night only adds more to it, making it a memorable experience. Most of the Bali tours skip a visit to this place, but you can create your customized plan if you wish to visit Wake Resto & Dolphin Bali. Add comfortable hotels to your plan, choose from the recommended hotels in Bali like Gatra Ubud Inn, The Peacock Inn, Kampoeng Joglo Abangan and Bije Sari Suite Bisma. How popular is Wake Resto & Dolphin Bali? People normally club together Bali Safari & Marine Park and Pantai Lebih while planning their visit to Wake Resto & Dolphin Bali. Really nice beach and a great place. Thing is that the place is deserted. No one here, just the sunbeds and some shade to hide from the sun. Ideal to spend a day on a black sand beach. Did not see it, but I imagine the sunrise is really spectacular (the mix of the black sand with the warm shades of the sunset). Hope it gets not destroyed or reahabilitated and surfers / bagpackers / turists can enjoy a free sun bed 😀. This establishment is incredibly cruel and needs to be shut down immediately. They keep 4 dolphins in an extremely small and shallow chlorinated swimming pool just feet from the open ocean. The chlorine burns their skin and sometimes can make dolphins go blind. They are kept hungry so they will be willing to perform on command. I watched them for 3 hours when they were not performing a show, and for 3 hours they spent the majority of that time poking their heads over the edge of the pool desperately searching for a way out. Please do not give this establishment a cent of your money. And please only visit this place if it is to tell them how cruel and horrifying their practices are. If you want to see dolphins in Bali there are multiple companies that will take you to see them in the wild. This will be a much more rewarding experience I promise. Thank you for your kindness. I'm really sad to keep seeing animals mistreating and seeing people not caring about it at all. Stop this cruelty! Dolphins are meant to be in the wild. They are not being rescued here, they are kept in captivity and over all in clorinathed water that makes them feel really bad. I know it might look cool on your vacation picture but I believe if you really like these animals as you say you do you shouldn't support this place at all. North of Bali have dolphins in the wild, just a few hours driving and you see them happily jumping together.